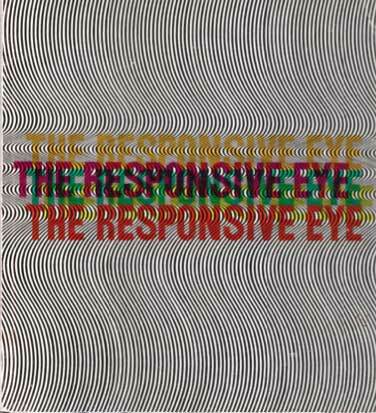 In 1965, an exhibition called The Responsive Eye, created by William C. Seitz was held at the Museum of Modern Art in New York City. The works shown were wide ranging, encompassing the minimalism of Frank Stella and Ellsworth Kelly, the smooth plasticity of Alexander Liberman, the collaborative efforts of the Anonima group, alongside the well-known Victor Vasarely, Richard Anuszkiewicz, and Bridget Riley. The exhibition focused on the perceptual aspects of art, which result both from the illusion of movement and the interaction of color relationships. The exhibition was enormously popular with the general public, though less so with the critics. Critics dismissed op art as portraying nothing more than trompe l'oeil, or tricks that fool the eye. Regardless, op art's popularity with the public increased, and op art images were used in a number of commercial contexts. Bridget Riley tried to sue an American company, without success, for using one of her paintings as the basis of a fabric design. Contributed to UbuWeb by Marcelo Gutman.